There’s a reason they call it The Clubhouse. The office is a revolving door. Characters come and go, news filters in and out, and the day is peppered with fun, crazy, and sometimes unbelievable events. The growers are in and out, we’re on the phone taking orders all morning, Corydon and CJ spend a lot of time leaning on furniture while waiting for orders, and to my happy surprise, there are plenty of snacks. Aside from having to adjust to a constant seated position (I miss being on my feet… I’m antsy) and being able to see, smell, and feel the oysters all day, it’s really not so bad. There are, of course, more visitors than there were on the float. Some are unexpected (like a friend from the Division of Fisheries and Wildlife who stopped by yesterday) while others are a pleasant surprise. Last week, it was Per Se Chef Jonathan Benno, his wife Liz and their daughter Lucy who stopped by to tour the farm and spend the night in Duxbury. They were in town for quick getaway while the restaurant was closed. (Jonathan said having the doors closed gave him his only opportunity to relax.) After arriving on a hectic, chilly afternoon, the whole family went down to the water with Skip and Shore for a tour of the float and the waterfront. 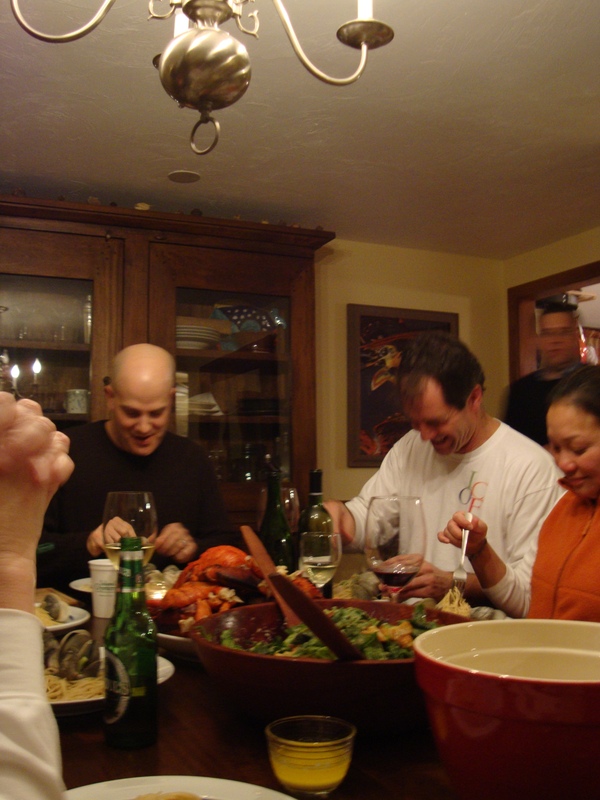 Skip’s parents, Nancy and Billy, had offered them a place to stay for the night so they decamped for the afternoon before leaving Lucy with Shore’s sister Hadley (a first-class babysitter) to join us back at Skip’s house for dinner. I’d seen Skip cook feasts on the float but had yet to enjoy a meal at his house. That afternoon we sat down to hash out the menu, which he pulled together on the spot (clearly he’s done this before) and then broke off to run errands. Back at his place, I worked on some easy prep while Shore helped Skip put together a new bench for the table. My mom called as we were prepping and asked who was handling presentation (it was, after all, the chef from Per Se). But Skip was all over it. 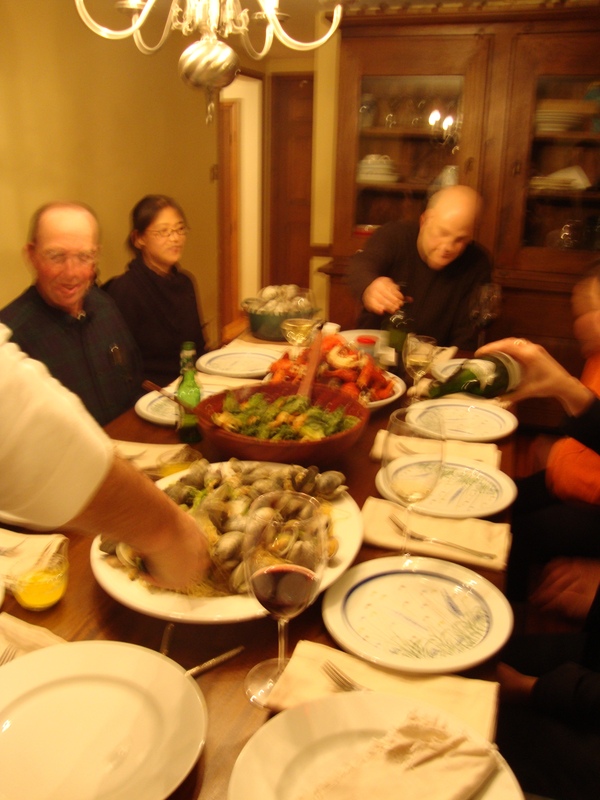 We would feast at an oyster farmer’s house in the oyster farmer manner: family style. 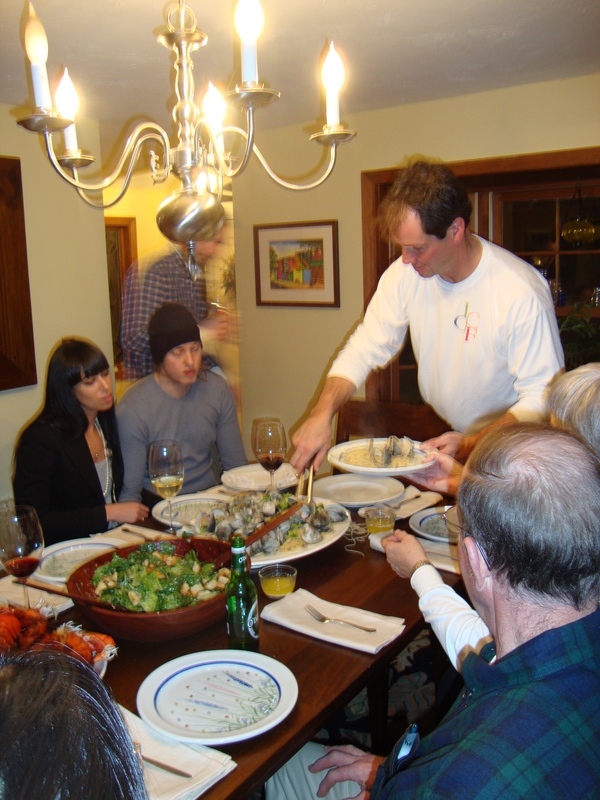 We started with a platter of Billy’s shrimp, a plate of oysters (Liz had her first Patriot Oyster), some fresh clams, cheeses, and prosciutto. Plus, Don Merry had called. He’d shot a duck that morning. Could he swing by with his son Ben and bring us a little? Jonathan was psyched. Don showed up with a plate of roasted duck breast which we ate with our fingers, dipping them into a raspberry jam he’d made from raspberries off of our friend Myrna’s farm. CJ was the last to arrive carrying in a pizza box. We gathered around him in the kitchen as he opened it slowly. Inside was an incredible spread of charcuterie made by our friend Jamie Bissonnette at his new restaurant Coppa as well as a rich and creamy washed-rind cheese from Formaggio Kitchen. Billy was a huge fan of the tongue pastrami. 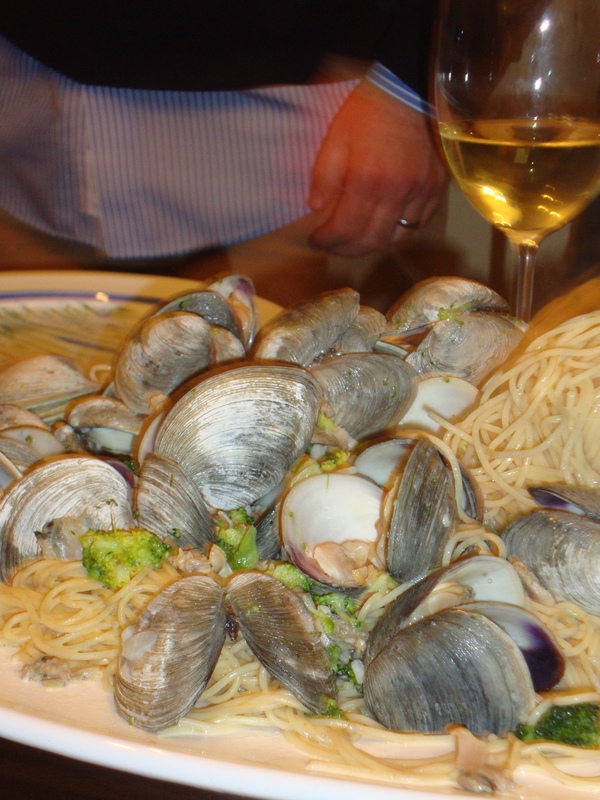 We set the table with mismatched cups and silver (Skip and I called it ‘farmer chic’) and sat down to platters of Caesar salad (the dressing was Skip’s made with fresh anchovies), garlicky spaghettini with littleneck clams and lobsters steamed by Skip’s neighbor Peter. We passed around a bottle of Au Bon Climat and later opened a dust-covered 1988 Australian Cabernet that Peter had been saving for 18 years. Skip doled out heaping plates of pasta and we all got to work. At one end of the table, Nancy described her favorite way to catch eels (bobbing for them, of course) and (reluctantly) shared her secret ingredient for lobster rolls (I’m saving that one for myself). At the other end, Skip told Jonathan and Liz stories about the farm and Peter’s wife Ligaya explained how she’d had to toss out her clothes just so Peter could carry that bottle of Cabernet back in their suitcase all those years ago. As we finished up with a French Memories meringue tart, Jonathan and Liz let us weigh in on naming his new, upcoming restaurant (he’s leaving Per Se at the end of this month to start the next chapter — an Italian concept near Lincoln Center). While I’m certain he already has the name picked out, we tossed around a few ideas for fun. I loved watching Jonathan’s face throughout the meal. He sat there smiling, almost in childlike awe, at the sight in front of him. I don’t imagine he gets many invites from people anxious to cook for him considering his role at Per Se — let alone take the time to sit down and enjoy a long meal with friends. But watching he and Skip, the farmer and the chef, sharing food that had come off the water that day and stories about their worlds was an unforgettable experience. I’m guessing it was for him, too. So I take back what I said there not being anything exciting going on at the office. Clearly, it’s nonstop action. In fact, we’ve got a busy couple weeks coming up and I already have a full plate.